Hello, my name is Hannah and I need help. The woman who happily assumes responsibility after responsibility. The woman who loves doing it all. The woman who stays up late and gets up early worrying about how she's going to get it all done. The woman who so prided herself in her usefulness that God decided she needed to write a book about humility. This woman has finally reached a place where she can ask for help. On October 4th, my second book Humble Rootswill release to the general public. But between now and then, I need a group of folks who are willing to read it and tell others about it. I need a group of folks who can help amplify the message of finding peace through humility. If you're anything like me, you're probably up to your neck in good work--family, church, community service. But if you're anything like me, you're also probably exhausted. Worn thin by the sheer weight of trying to do more and be more than God intends for you. In Matthew 11, Jesus invites people like us to find rest in Him. "Come to me, all you who are weary and burdened" He calls, "and I will give you rest." But this rest doesn't come by throwing off good things, having tighter schedules, or simply learning to say "No." This rest comes through humility. It comes by learning limitation and dependence. "Take my yoke upon you and learn from me," Jesus continues, "for I am gentle and humblein heart. And you will find rest for your souls." Too often, the desire to do good work can mask a deeper pride. We busy ourselves with good things, not simply to fill the need, but because we need to be needed. We need to know that we are important, to know that our lives matter. And so to quiet our fears and stroke our egos, we try to save everyone and everybody from everything. But we are not God. And when we try to be, we end up stretched, worn thin. While we're busy saving the world, we're losing our own souls. So let me say it once again: I need your help. In the past, I might have tried to launch a book on my own. To do enough work behind the scenes to make up the difference of having to humble myself and ask for help. But today, I know better. 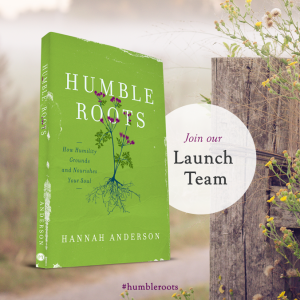 If you'd be willing to receive an advance copy of Humble Roots, read it, and commit to to sharing it over the next few weeks, please go to this form. There, you will find more details about how you can help. More than anything though, I want you to join me on this journey to rest, to walking the path of humility. I want you to come with me, through field and forest, to discover how the natural world declares the glory of God and reminds us of our limitations. I want you to learn how honey and blackberries and wild grapes teach us dependence. I want you to believe that the One who cares for the lilies of the field will care for you too. I want you to know the peace of wild things. So will you come? Will you join me?